RealArcade, a free download, offers a huge selection of more than 700 download & online games--puzzle, word, action, and arcade classics. 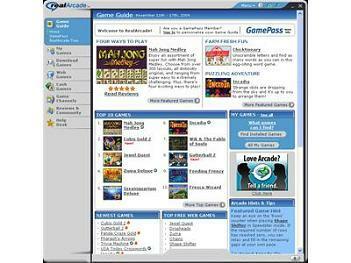 RealArcade also has features that help you find, manage and play all your favorite games. Other features include a download manager for smooth downloads, helpful automatic system-requirement checks, and secure transactions. RealArcade also includes Web-based games that run directly in your browser; and for those looking for some friendly competition, there's an online community for matching players, sharing information, and enhancing the overall gaming experience. Help you find, manage and play all your favorite games. Includes Web-based games that run directly in your browser; and for those looking for some friendly competition, there's an online community for matching players, sharing information, and enhancing the overall gaming experience.